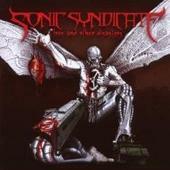 Swedish metalcore sextet Sonic Syndicate portray the perfect product of their environment as "Love and Other Disasters" carefully follows templates from the genre's commercial successes to comprise this band's by the book sound. Tracks like "Contradiction" easily fit somewhere on the Bullet for My Valentine radar, while the pseudo-ballad "My Escape" and "Damage Control" takes the keyboards out for a spin for a trip reminiscent of Scar Symmetry or Bleeding Through. Sonic Syndicate's solid yet completely unoriginal metalcore grows weary after a few spins, but won't tire those entrenched in flavor of the week mallcore. For more information, check out http://www.sonicsyndicate.com.